Written by: JWT Editorial Board on April 21, 2018. 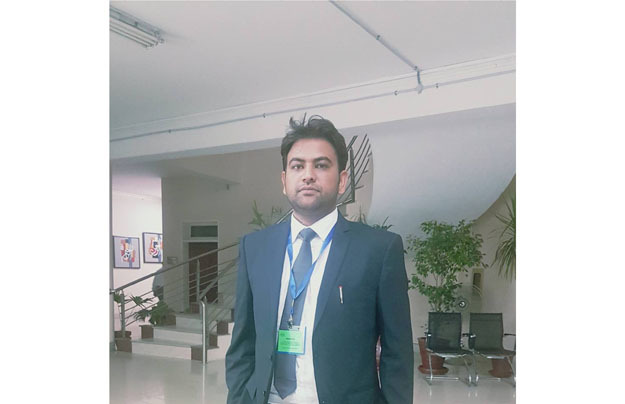 Kamran Ashraf (KA): I got my early education in Chiniot, my native city. I did FSc (pre-engineering) from BISE Faisalabad with 88 percent marks. 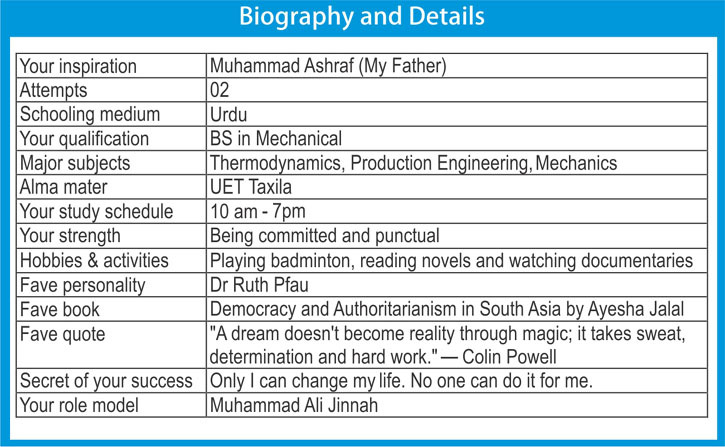 Later, I graduated in Mechanical Engineering from UET, Taxila. After that, I started preparing for combined competitive examination (PMS) and remained successful by securing 6th position in Punjab. JWT: How would you rate the World Times Institute? KA: WTI is the institute that regularly provides nourishment to its students. The faculty and resource persons inculcate the true spirit of competition in the aspirants for competitive exams. Regular tests and other preparation methodologies are par excellence. One can polish one’s skills at the WTI. The thing I liked most about WTI is the individual care and attention accorded to students in almost every portion of reading, writing and speaking. The best part is that they don’t deal at a general level; they specifically work on removing flaws and honing skills of aspirants at an individual level. JWT: What, in your opinion, is the key to getting through compulsory papers of PMS exam, especially that of General Knowledge? KA: It is a general perception that compulsory subjects of PMS exam are a tough nut to crack and if one gets through both papers of English, one can easily crack the exam. Composition paper is a tricky one; it’s an examination of your skills in aptly using the English language. One has to have full command over all the fundamental principles of English grammar. English Essay paper is a game of ideas; one has to discuss different domains of the given topic in a logical and coherent way. For General Knowledge paper, one needs to go through the previous papers of PPSC/FPSC in order to have a precise idea of paper pattern. For this purpose, I think, the aspirants should take various one paper MCQs tests for the vacancies announced by PPSC and/or FPSC as it would give them a fair idea of diversity of topics. In this way, when they will be sitting in the PMS exam, they will, surely, not repeat the mistakes they had made in such papers. By following this, 10-15 repeated MCQs will definitely enhance their score in GK paper. JWT: How answers should be written to get maximum marks in the written part of PMS exam? KA: Answers should be written in such a way that the examiner is highly impressed with that. A twenty-mark question is worth 7-8 pages. Aspirants should be well aware of the nature of the question; whether it is descriptive, analytical or argumentative. For this, grasping the main statement of the question is necessary as words like ‘elucidate’, ‘critically analyse’ or ‘comparison’ tell you what examiner wants to see in your answer. Every subject should be dealt with different approach; for instance, paper of Pakistan Affairs demands a flashback perspective and future course of action. Add value to your answer by including maps, authentic statistics and giving a comparison with developed models. Every add-on will enhance your marks. KA: I chose the topic “Human Rights is one of the most fundamental issues facing humanity as well as the most sensitive and controversial.” As it is evident from the statement, the examiner wants a complete description and genuineness regarding human rights and how they have been made sensitive and controversial. I spent 15-20 minutes on brainstorming. Then, I drew an outline wherein I covered all the domains of the topic. I gave a powerful Thesis Statement as I feel it is essential for it is with this that the examiner determines your understanding of the topic. The body of my essay contained different styles of paragraphs. For instance, some paragraphs provided statistics while some contained description with illustrations. In the end, a highly convincing conclusion added beauty to the whole essay. KA: I believe there are no hard and fast rules in extension and restriction of words. Sometimes aspirants feel that the answer they are writing should take only 2 pages and increasing the word limit would affect its quality. But, remember, you are writing for twenty marks. So, you have to divide it into various domains and try to connect its different perspectives to the main idea. One should learn the art of writing answers with proper introduction, body and conclusion. 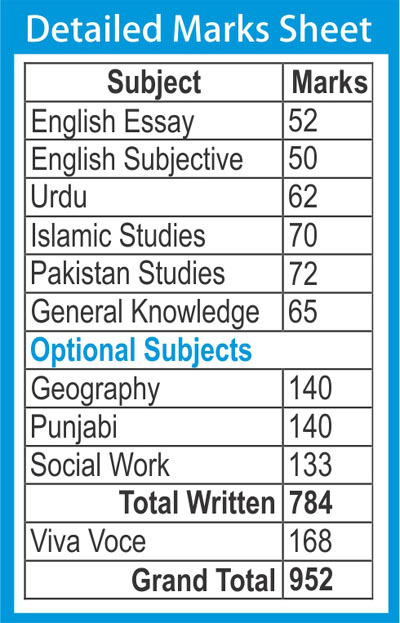 JWT: Is it better to attempt optional papers in Urdu or one should go with English only? KA: In my opinion, English is a better option as it will create an impact on the examiner. Writing is also another indicator which makes one’s paper more presentable and attractive. JWT: How one should choose Optional Subjects? KA: One should keep in mind the area of interest besides scoring trend in the PMS examination. Students should broaden their capabilities by adopting social sciences for it will come in handy during interview as well. JWT: Who deserves the credit for your success? KA: I express my profound gratitude to Almighty Allah who gave me strength and courage to sail through the PMS examination. Then, the whole credit of my success goes to my parents and my elder brother as they stood by me through thick and thin. My sister, too, always remained an encouraging hand in all my endeavours. JWT: What was your strategy to prepare for the interview? KA: My interview strategy was quite simple and natural as I was determined to be true to my words. I covered all the emerging and new trends in global politics and also had a bird’s eye view of my optional subjects. I believe one has to show a neutral and optimistic opinion about the country’s affairs. Speaking volume, dressing sense and sitting postures will also contribute to your interview score. First of all, work hard in English language. Put in maximum efforts to remove flaws in your language skills. Secondly, take practice test for the final go. And last but not least, believe in yourself because none but you know where the shoe pinches. Interview is a real test of one’s mettle. It is nothing but a response to a pressure or a haphazard situation. During the interview with the panel, I remained highly confident all through the process. I was giving satisfactory answers to the interviewers but suddenly they started asking questions on general knowledge in quick succession. Pressure increased and I got a bit confused. However, I regained my confidence by telling myself that the interviewers are trying to puzzle me. Meanwhile, the chairman asked me to make a speech on ‘qualities of leadership’. I rejuvenated my strength and spoke for three minutes on the topic. This post has been seen 18919 times.